Romania is not the only country where one can find rocks with weird shapes. 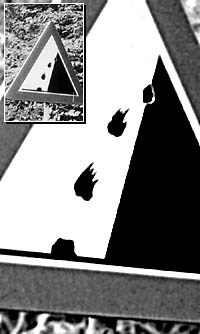 Can you guess (yes, without looking at the hints) where these falling rocks were found? 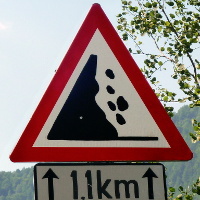 We have already recorded several countries where Falling Rock signs feature speed suggesting stripes (e.g. Norway, France, Sicily, Pakistan among others). These aren't simply velocity strokes any more. 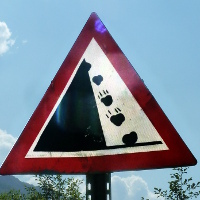 The boulders are distorted by the velocity and the resulting high temperature. This can't be on our Earth: gravity isn't strong enough to have this effect on rocks made of stone. Are they perhaps made from jelly? I've been told that Romanians love meat and goose jellies, but that can't be true, can it? The stones in fligth definitely (Had to look up the correct spelling) behave like jellyfish. This may very well be a new lifeform hitherto unknown to science. They emerge from the rock, morph into the open air shape and then after landing change shape again into some kind of a pillow. What a discovery — I think I'll name them Aurelia petrophila or Roadjellies! 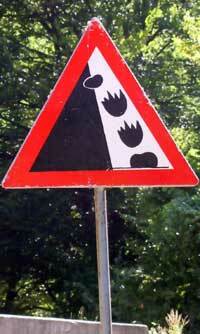 Reminds me of a roadsign from Iceland. The cliff is different but the constellation is the same.